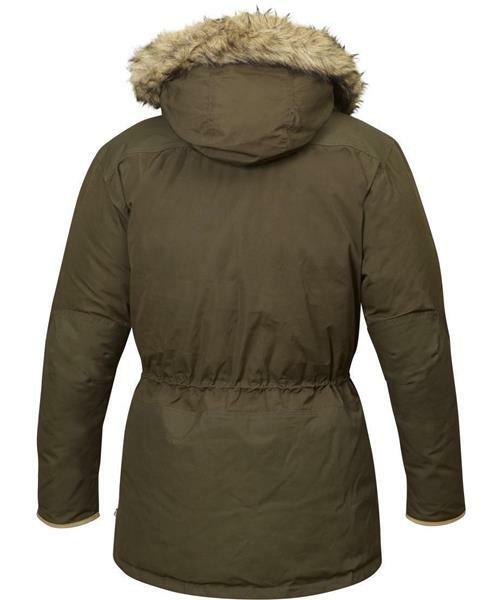 An extremely well insulated winter parka for professional use in Arctic conditions. Reliability and functionality have been paramount in its development and every stitch of the jacket has been constructed to withstand considerable pressure and protect its wearer against long exposure to extreme cold. The cut is long and it has a deep storm hood with detachable synthetic fur edging for extra protection against bitter winds. The two-way zipper is hidden behind a protective flap with buttons that are attached with corded ribbon. All buttons and zipper grips are oversized so that they can be easily handled when wearing thick gloves. Several spacious pockets on the chest and lower down have room for a GPS, ski goggles, extra gloves, etc. , and cold fingers can be warmed up in the hand warming pockets at chest height. There are also pockets inside the jacket, as well as a pair of detachable braces that let you have the jacket "on" without using the sleeves – practical, for example, when shovelling snow or partaking in other hard work when you don't want to risk losing the jacket in a sudden gust of wind. Sleeve cuffs with Velcro adjustments and a drawcord to adjust the waist. The primary fabric is G-1000 Eco in recycled polyester and organic cotton and the padding consists of ethically produced down. The shoulders, sleeves, lower back and pockets are reinforced with G-1000 HeavyDuty Eco and the jacket is lined with polyamide. The hand warming pockets and the inside of the collar, against the chin, are lined with warm wool from the renowned cloth mill Abraham Moon.